Range: Labrador and Newfoundland to Alaska, south to northern New England and northern New York. 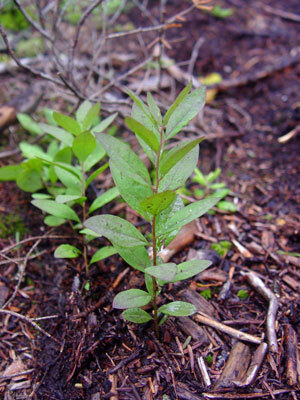 Aids to Identification: This perennial herb grows to 10-30 cm, with veiny, rounded or blunt leaves, 1-4 cm long. The flowers grow on stalks from the leaf-axils in groups of 3, usually 2 of the 3 flowers bear pollen only, so only one flower of each cluster will actually develop into a fruit. The petals are greenish-purple and triangular. The fleshy fruit is juicy, 5-10 mm thick, and orange-yellow to red in color. 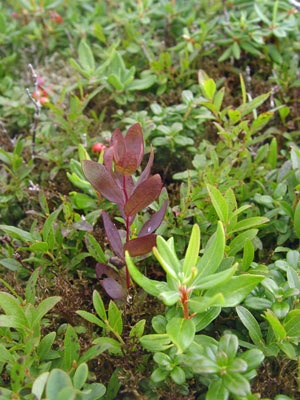 Ecological characteristics: In Maine this species typically occurs in nutrient poor areas, such as peatlands or krummholz, often in association with ericaceous vegetation. Phenology: Flowers June - August. 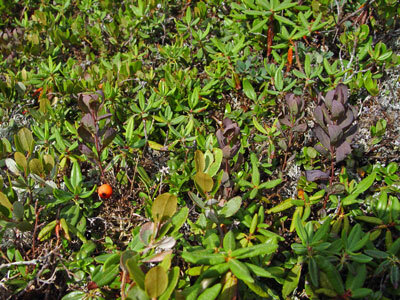 Known Distribution in Maine: This rare plant has been documented from a total of 19 town(s) in the following county(ies): Aroostook, Franklin, Oxford, Piscataquis, Washington. Reason(s) for rarity: Disjunct from principal range. Inconspicuous and easily overlooked when not in fruit. Conservation considerations: Maintain hydrology of its wetland habitats. Some populations in the Mahoosucs may be subject to heavy recreational (hiking) impacts.